an orthopedic appliance or apparatus used to support, align, prevent, or correct deformities or to improve function of movable parts of the body. See also brace and splint. cervical orthosis a rigid plastic orthosis that encircles the neck and supports the chin and the back of the head; used in the treatment of injuries to the cervical spine. Cervical orthoses. A, Soft foam collar. B, Firm plastic collar. 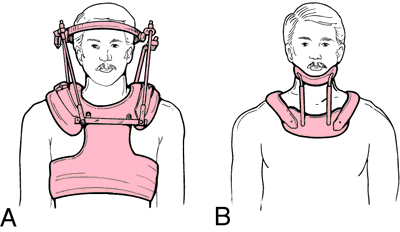 Cervical orthoses offering rigid support to the cervical spine: A, Halo-type cervical orthosis attached to a polyethylene jacket. B, Four poster orthosis. dynamic orthosis an orthosis that both gives support and aids in the initiation and performance of movement by a body part. flexion orthosis (flexor orthosis) tenodesis splint. an orthosis designed to limit cervical spine motion to varying degrees, for example, a soft cervical collar. 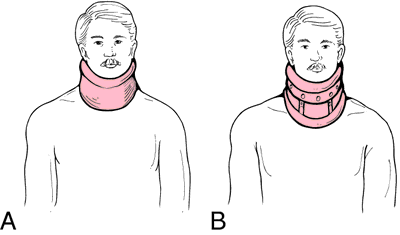 An orthosis designed to limit cervical spine motion to varying degrees (e.g., a soft cervical collar).